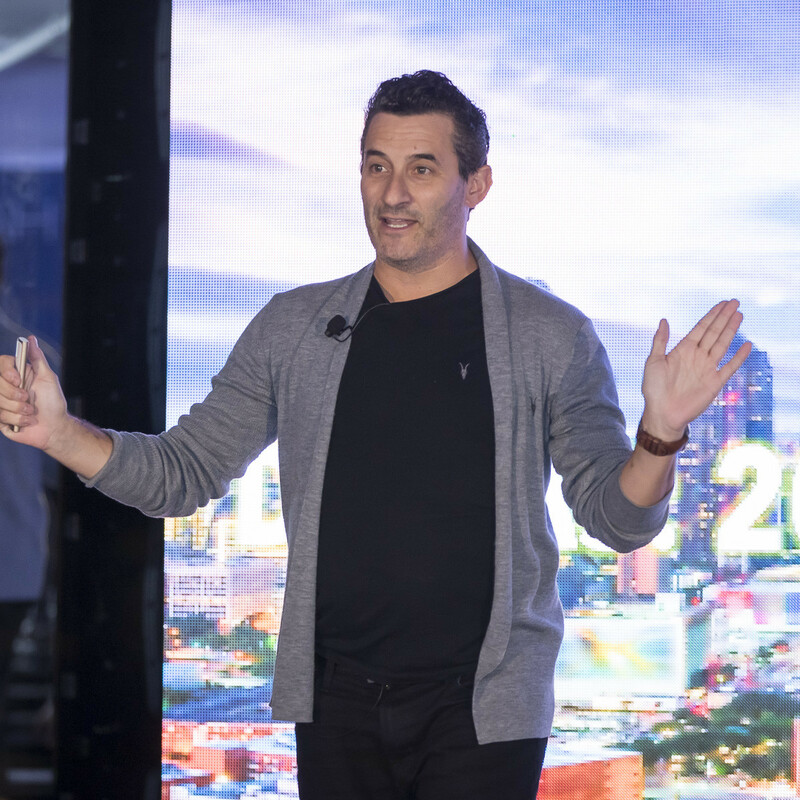 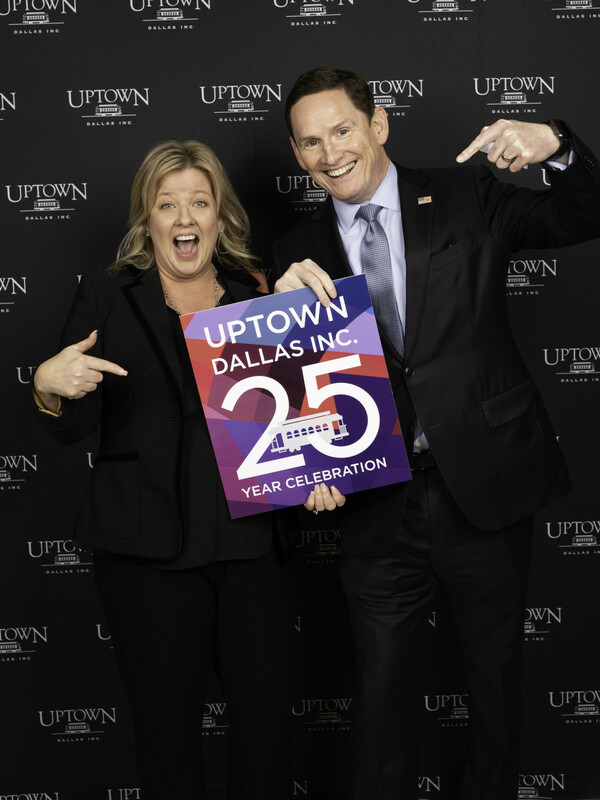 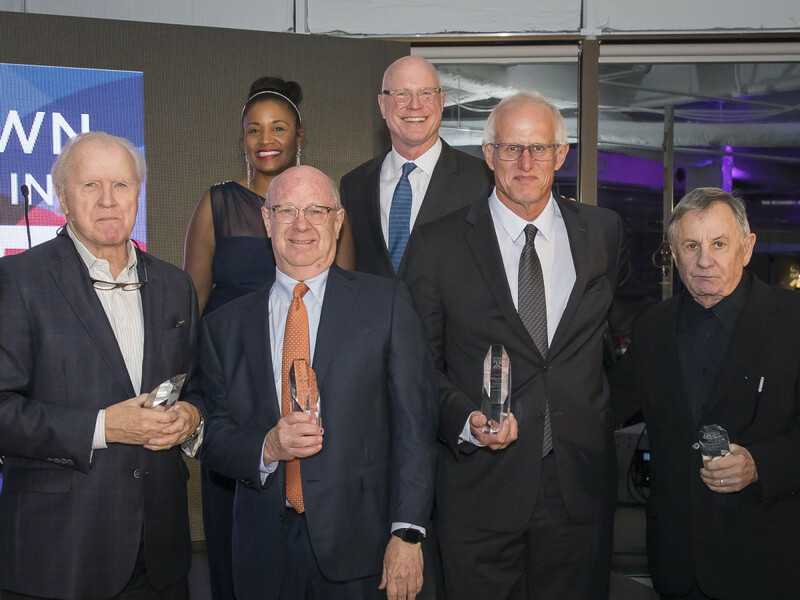 It's been 25 outstanding years for Uptown Dallas, Inc., and a veritable who's who of Dallas' movers and shakers gathered to toast that occasion at a VIP dinner party hosted by the organization. 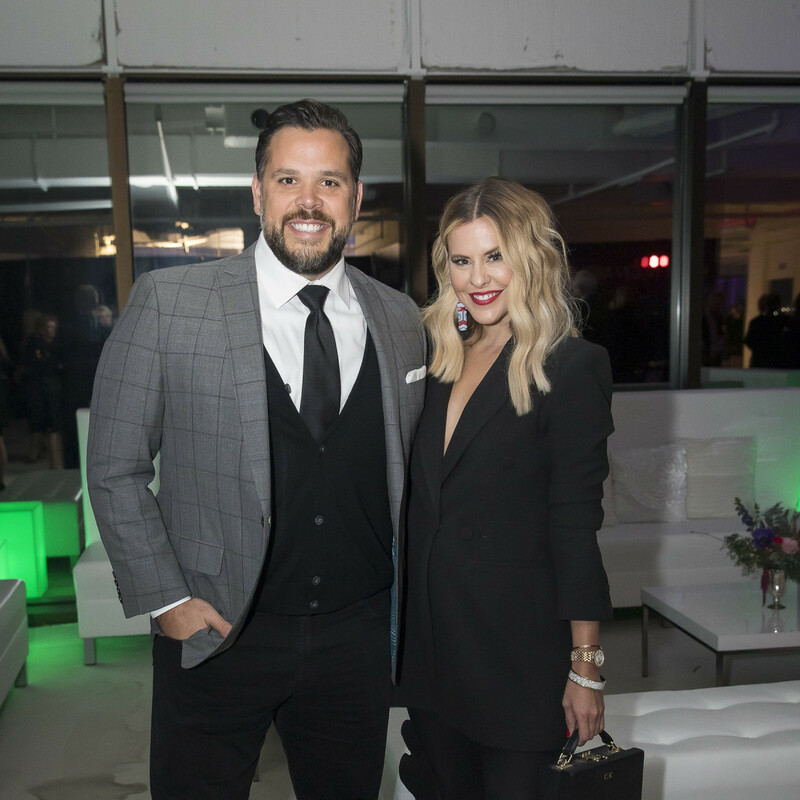 The One McKinney Plaza building was transformed into a party wonderland, with a family-style dinner, signature cocktails, photo ops, and live music — not to mention gorgeous views of Uptown and the rest of Dallas. 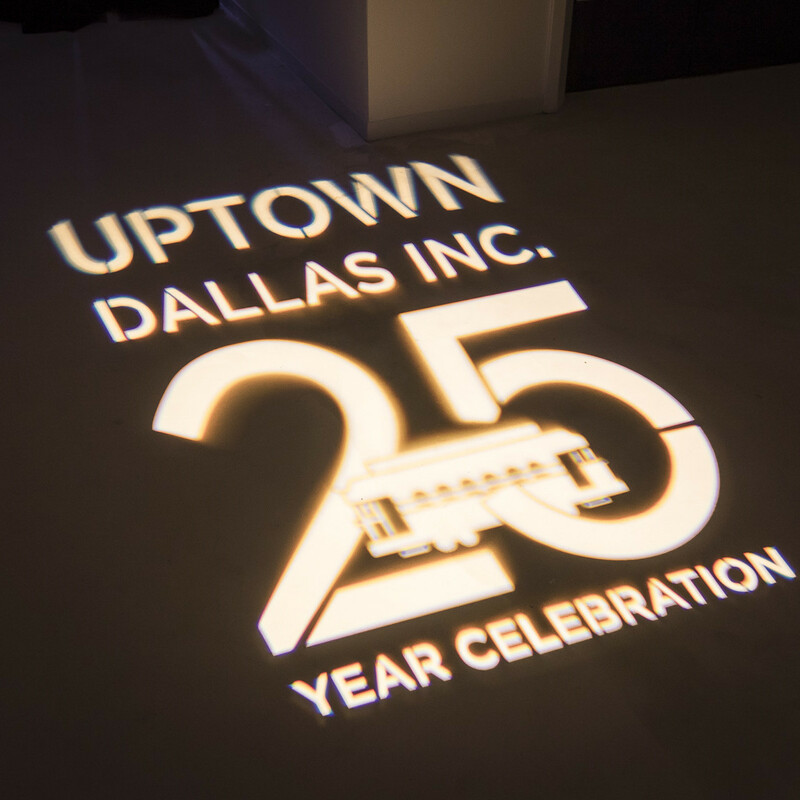 The event capped a year-long celebration of Uptown Dallas, Inc., which manages the public improvement district founded a quarter century ago that exists to promote the neighborhood's resources and infrastructure, including supplementing public safety, beautification, maintenance, capital improvements, public art, and marketing. 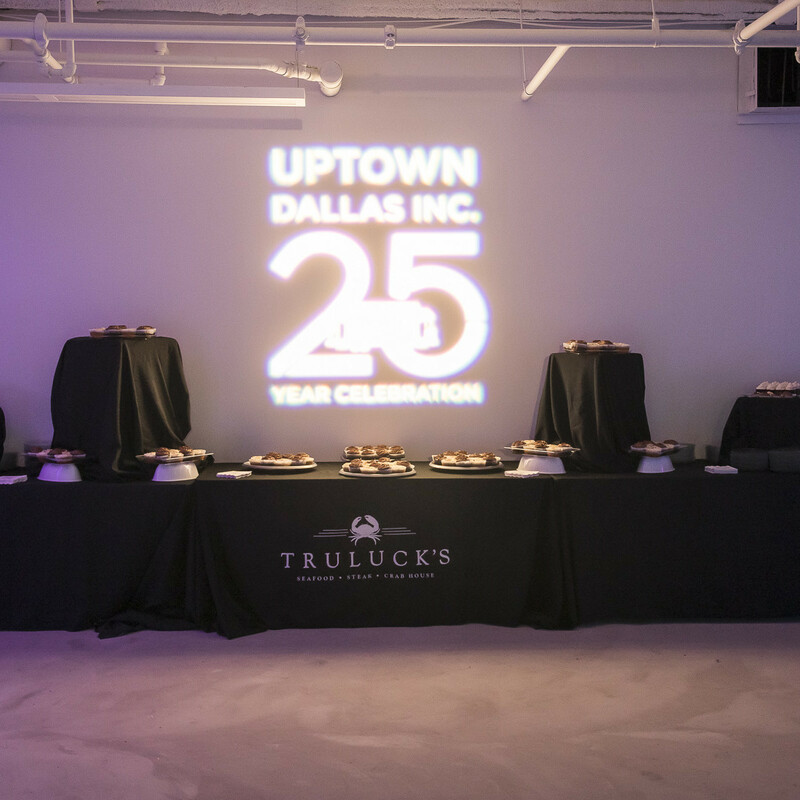 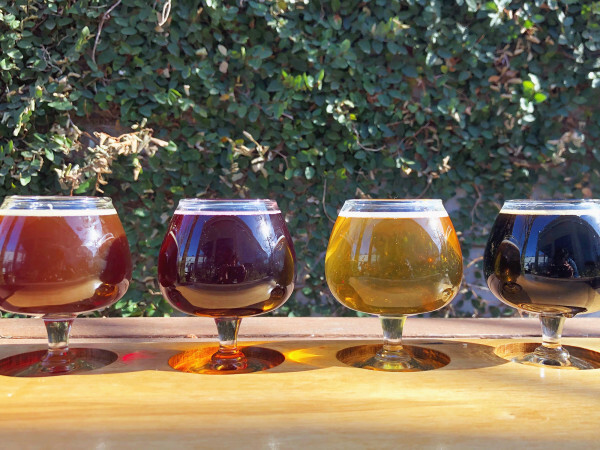 Under the organization's stewardship, the neighborhood has transformed from an area verging on decline to one of Dallas' most vibrant districts worth more than $6 billion in property value, with more than 200 restaurants, 160-plus shops and 13 million square feet of office space. 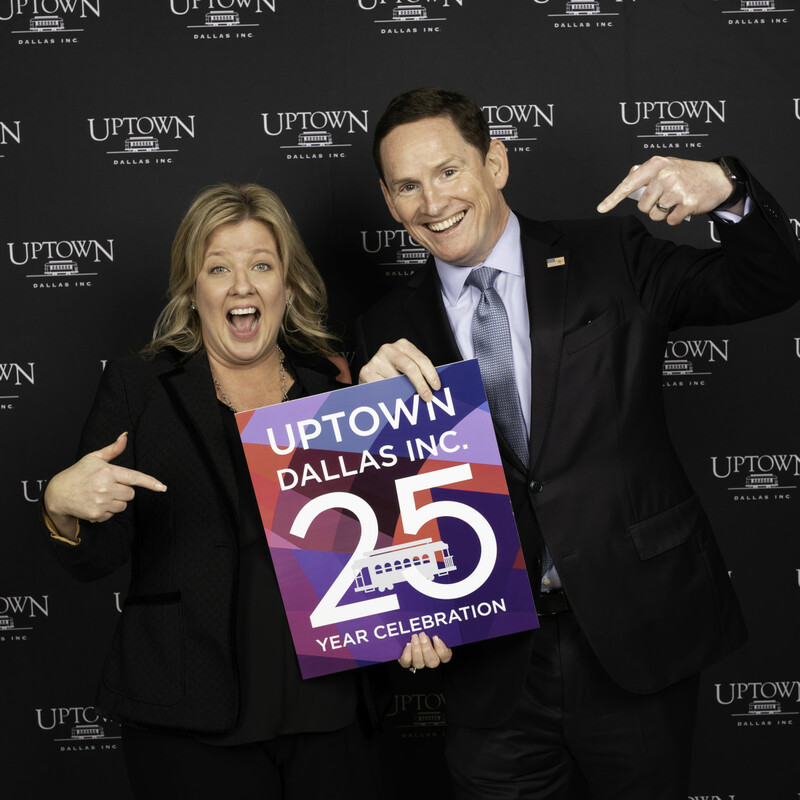 It's no wonder that more than 19,000 residents call Uptown Dallas their home. 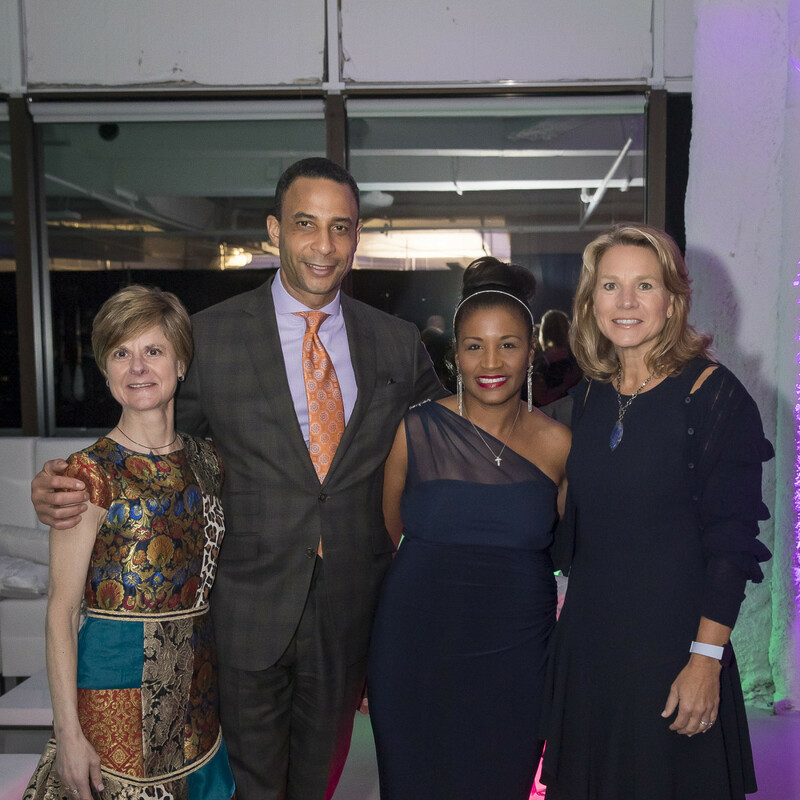 The night's program opened with UDI's interim executive director and president, Noelle LeVeaux, and chairman of the board, Jud Pankey, welcoming the crowd of major players, businesses, residents and supporters. 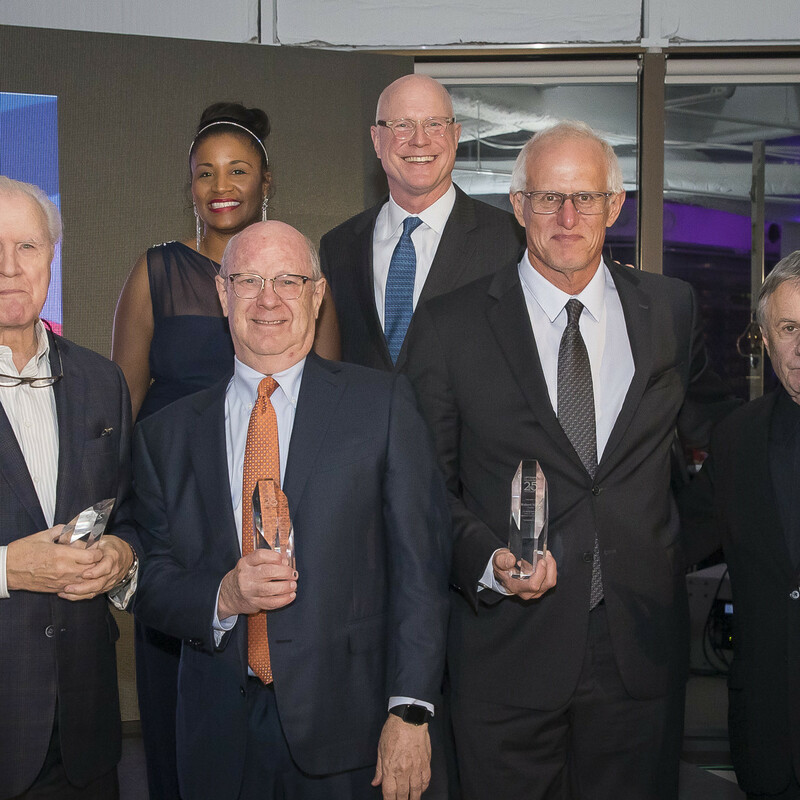 After celebrating some of the many accomplishments of UDI, they graciously thanked the founders of the Uptown PID — Phil Cobb, Hank Rossi, Robert Shaw, Neal Sleeper, and Charles Womack — with an award and a video, recalling the days when it all started and the significant contributions that each has made. 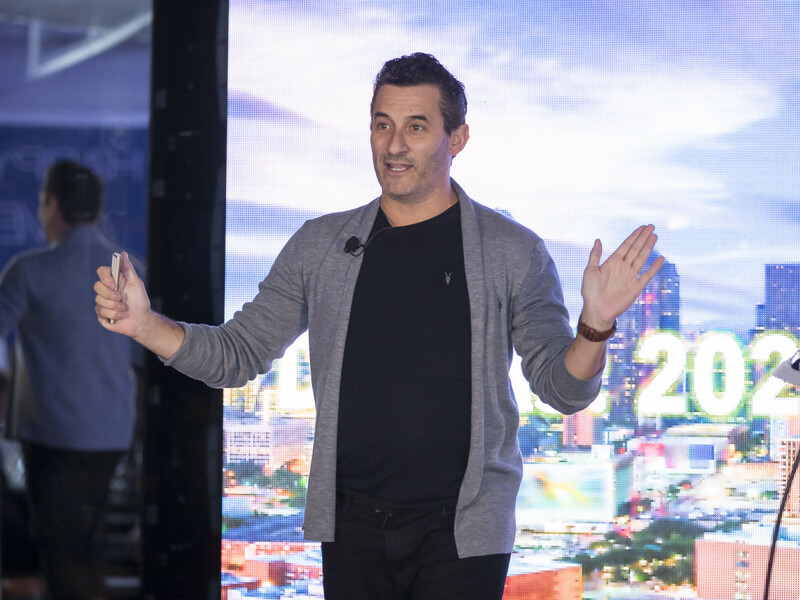 The evening continued with keynote speaker Matt Britton, the bestselling author of YouthNation, sharing his valuable insights about how to continue to be successful with the next generation, ensuring continued growth in business and new urbanism. 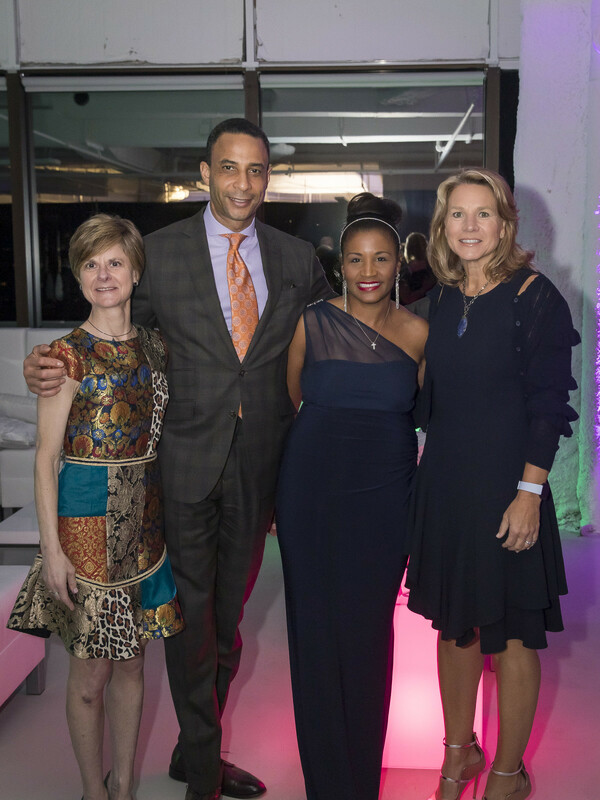 The event was attended by top politicos such as Dallas City Council member Jennifer Staubach Gates, Dallas County Judge Clay Jenkins, former District Attorney Faith Johnson, Dallas assistant city manager Jon Fortune, Dallas Parks & Recreation board member Paul Sims, former council member Angela Hunt, North Dallas High School principal Katie Wanserski, and Susan Mead, original legal counsel to UDI's founders. 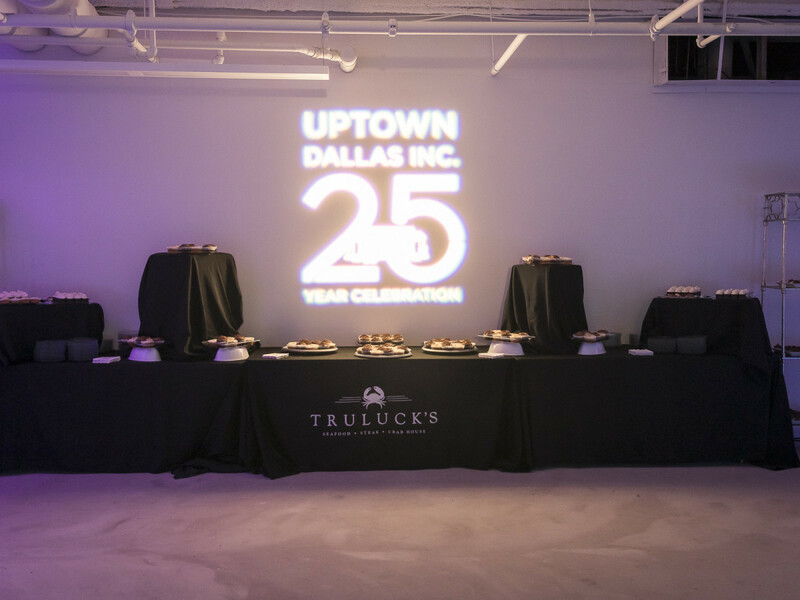 Once the plates had been cleared, it was time to make way for more post-dinner party pics, an after-dinner dessert display from acclaimed Uptown restaurant Truluck's, and the energetic sounds of the Time Machine Band. 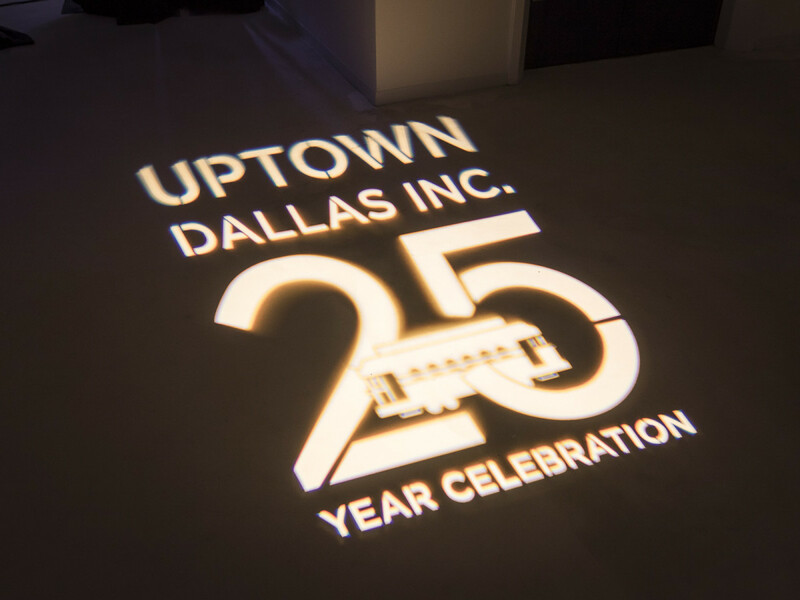 Uptown Dallas, Inc. truly knows how to throw a party. 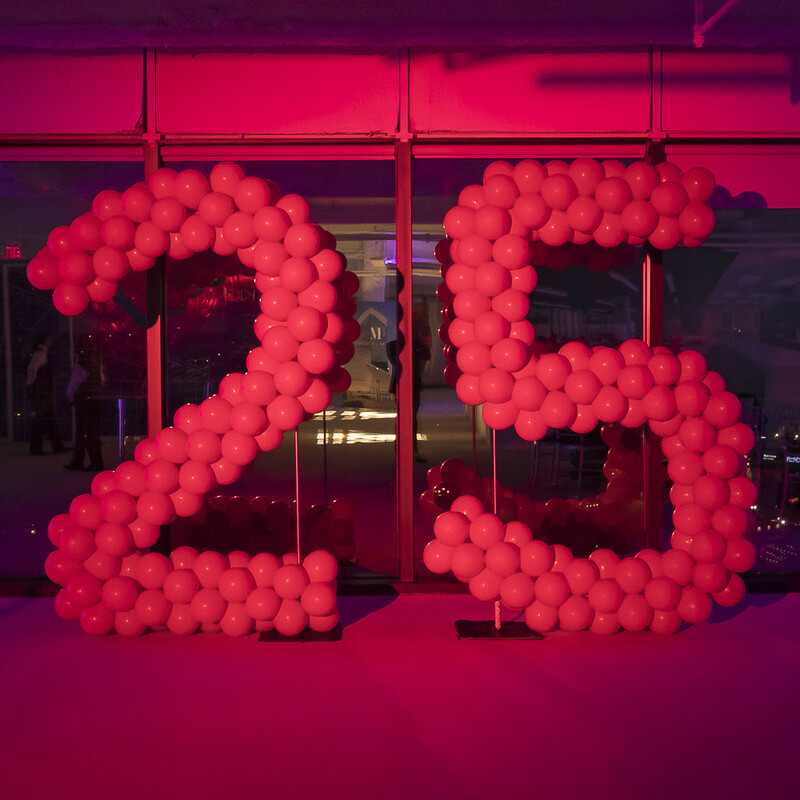 For the more than 350 guests in attendance, the magic commenced the second they stepped into the sleek, modern lobby of One McKinney Plaza, where they were welcomed by servers offering "Toast to 25," an effervescent cocktail with vodka and bubbly designed especially for the event by the Bowen House and Uptown Hospitality Association. 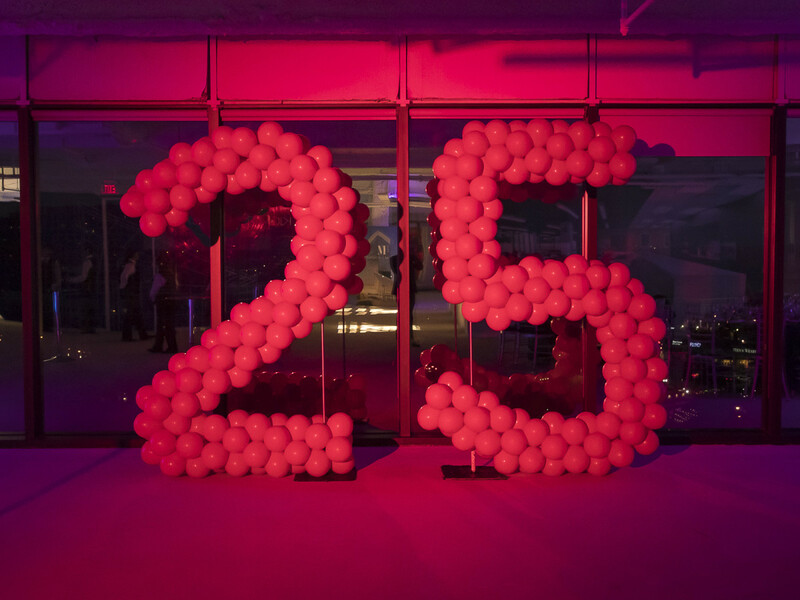 After some gracious mingling and a quick photo op — in front of the signature "BIG" campaign's legendary oversized letters, of course — partygoers were whisked into an elevator and escorted to the 10th floor party space, generously donated by the Gaedeke Group. 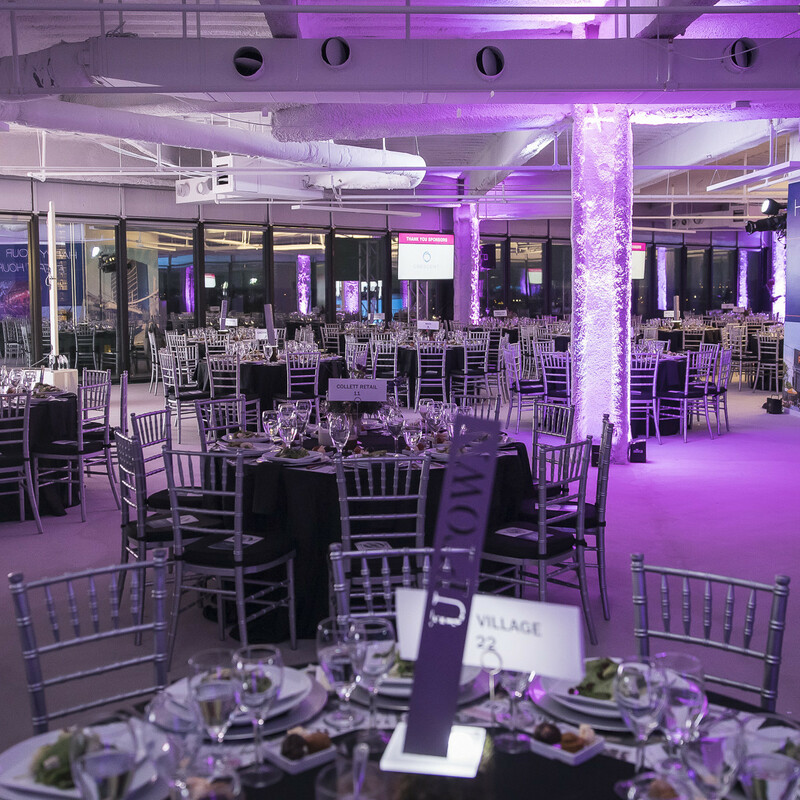 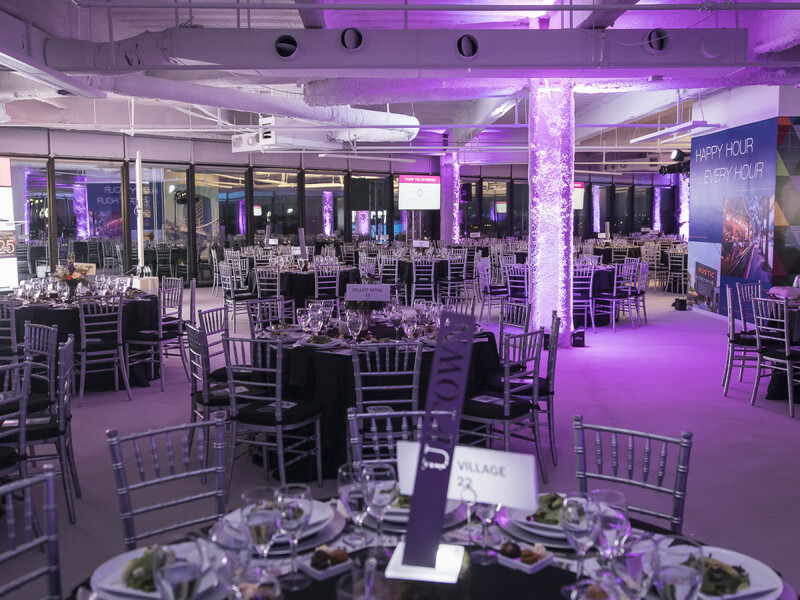 Alighting from the elevator, they discovered a grand space cast in cool white, boasting numerous open bars, a stage, and stunning tablescapes featuring miniature re-creations of the famous Uptown "javelin." 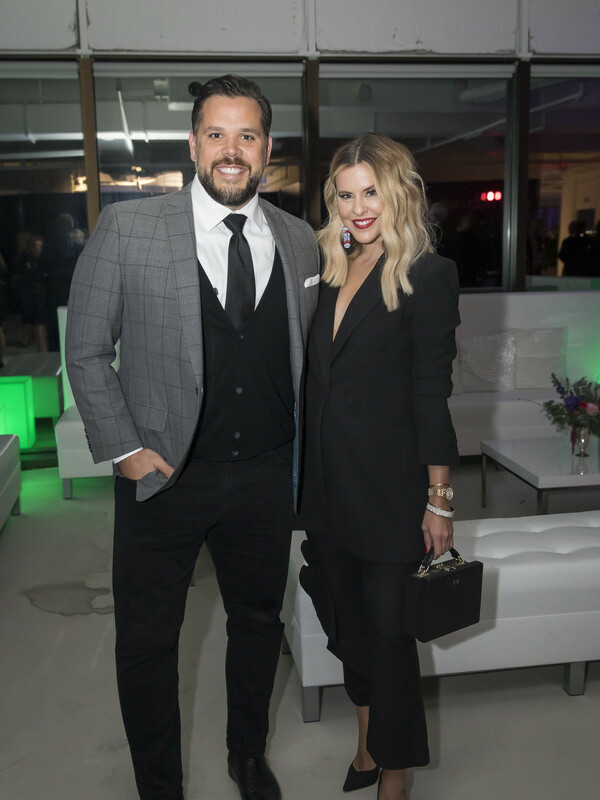 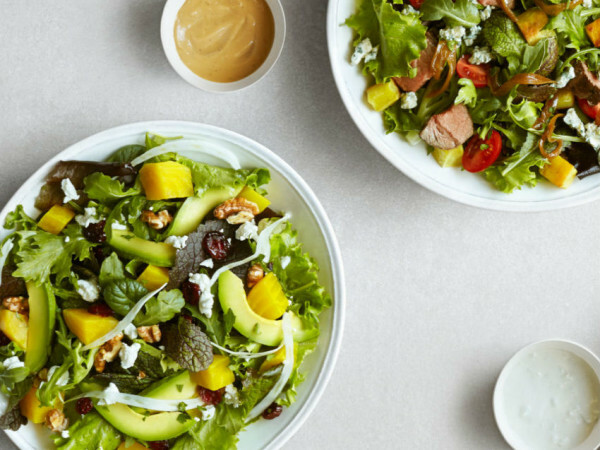 Following some judicious clinking of cocktails, attendees sat down to a divine family-style meal, with guests enjoying the jocular camaraderie of passing bowls brimming with short ribs, roasted chicken, and fresh vegetables. 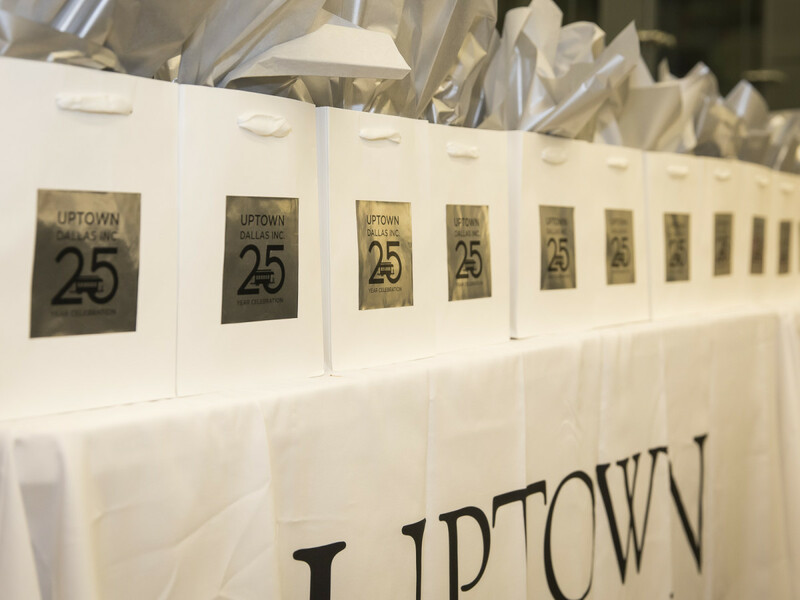 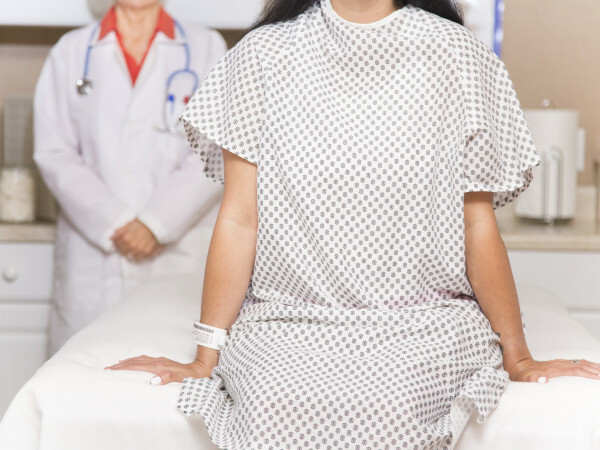 On their way out, guests scooped up goody bags containing a bottle of Champagne, an Uptown coffee mug, body washes from Canopy, and facial ingredients from the Crescent Spa. 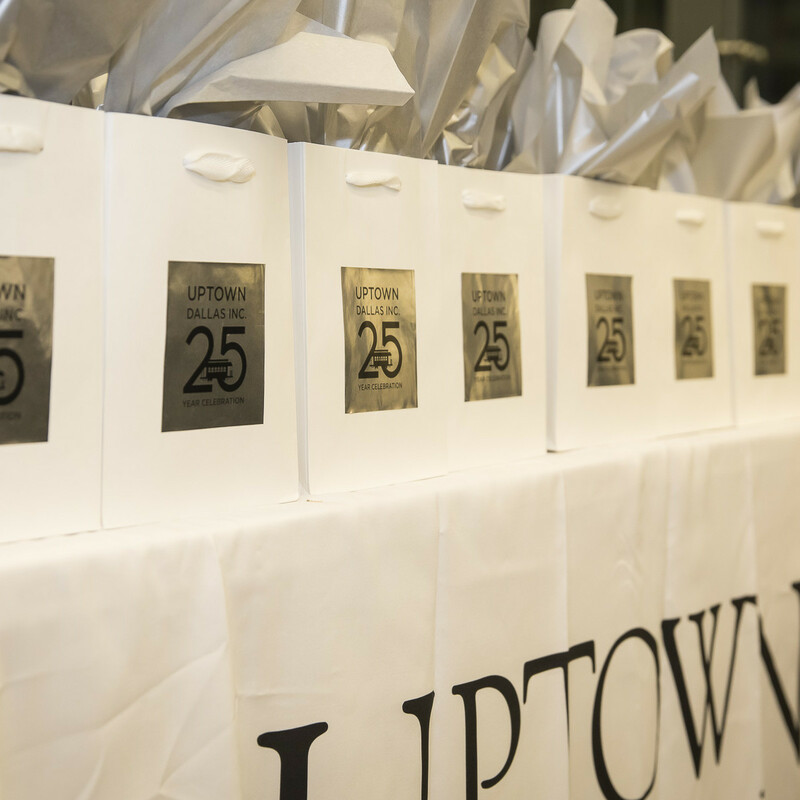 All in all, it was a magical night celebrating an organization who has helped to spur Uptown to the success that it is.